Don’t start looking for tickets to watch them tearing up Royal Melbourne. 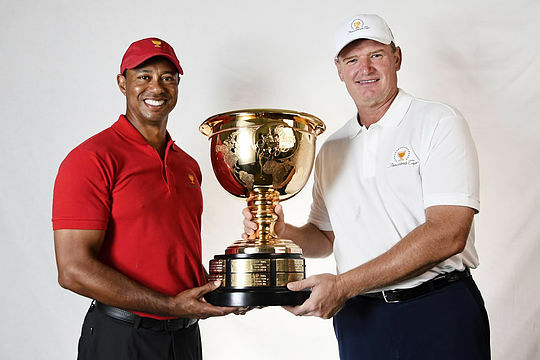 Yet rival Presidents Cup captains Tiger Woods and Ernie Els will be in Melbourne in coming weeks just to check things out for next year’s Presidents Cup. This will be Woods’ first visit to Australia in almost seven years when he hits town on December 5 and 6. Els will beat him there though as he visits during next month’s World Cup of Golf being played up the road at another sandbelt gem Metropolitan. Woods made a dramatic return to the Ryder Cup team this year, after initially being named as one of Jim Furyk’s vice-captains before relinquishing that role to play with the team. Yet the 14-time major champion has made no such commitment to the US Presidents Cup team…not yet anyway. “We’re a long way from having to make a decision whether I’ll play or not; it’s still more than a year away,” said Woods. While he probably won’t tee it up while he is in Melbourne, Woods has agreed to take part in some promotional activities to mark one year out from the Presidents Cup. Meanwhile Els will also take time to check out potential International team members by being at Metropolitan for the final round of the World Cup. He will also scout Royal Melbourne, where it is believed he will push Presidents Cup organisers, the PGA Tour, to have significant influence over the set-up and conditioning of Australia’s No. 1 course. “I want to meet with the course superintendent, Rich Forsyth, to talk about the course, recent conditions and how it might play in 2019,” said Els.